The Sunflower Fence is arranged around a seagrass woven mat that measures 5" squared. Attach to the side of the cage with a cable tie that is provided. A nice toy for a special needs bird or to place close to a favorite perch. 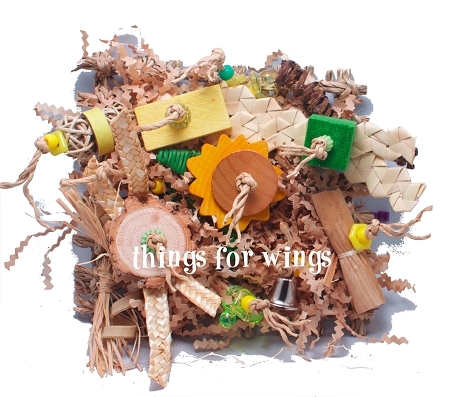 palm, raffia, cane, shred, beads and charms, balsa, bagels and natural wood coins. A Painted Things for Wings© product.